So I was talking with a friend about potentially doing a variation on the album evenings we’ve been doing recently, and wondered whether a greatest hits evening might work. And instead of playing the album on vinyl, bring playing those greatest hits as 7″ singles, in all they’re crackly glory. But who would we pick? Well the conversation soon turned towards this band, and so I thought I’d give a few of their songs a try and see whether they might work. My Abba journey has been a not untypical one, I suspect. This songs was – in fact – the first single that I ever brought, wrapped in the Epic orange sleeve. And the album from which it was taken, 1976’s Arrival, was likewise the first album I ever brought (from Landports department store in Portsmouth, if you’re asking!). Through the late 70s Abba were my band, and it wasn’t until 1981, when my musical interests started to broaden, and deviate somewhat from the mainstream, encouraged in no small part by my consumption of the music press, that the love affair with Abba began to wane. Clearly, at this point, the (apparently) cheesy, european, middle-of-the-road, mainstay of the middle-aged sounds were doing my musical credibility no good, something I remember being accentuated by Not The Nine O’Clock News’ Super Trouper parody. So the super Swedes were somewhat hastily jettisoned. But years go by, we grow and up mature (a bit! ), and in doing so we realise that some of the decisions of our youth were not always good ones. And slowly the rehabilitation followed. 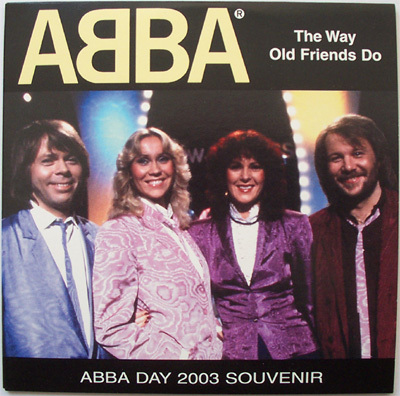 Obviously that re-discovery and re-evaluation was a more widespread phenomenon than just within my own head, because when 1992’s compilation Abba Gold was released it immediately became a huge best-seller, now ranked as the bands best-selling album ever, one of the top 50 selling albums across the world ever, with sales in excess of 28 million. Knowing Me, Knowing You is – for me – a classic example why the music of Agnetha, Benny, Bjorn and Anna-Frid (I was always a Friday girl, myself!) has lasted down the years. For all the accusations of cheesiness and inanity that are thrown at the group (and there are definitely examples of that) there are plenty of examples of real emotional depth and deep melancholy in their songs. The state of the bands own internal relationships were often mirrored and played out in the dynamics of the songs, none more so than in the video for 1980’s The Winner Takes It All. And sometimes were predicted by the songs, as was the case with Knowing Me, Knowing You. Written and recorded at the time that the band were happy loving couples (Agnetha and Benny, Bjorn and Anna-Frid) the song’s rather bleak relating of the breakdown of a relationship, haunted by the memories of the good times that are forever lost, certainly isn’t for the feint-hearted. Yet the song was a huge success all around the world, helped in no small part by the classic video (directed – as were many of the bands videos – by Lasse Hallström, later to find fame with films like Chocolat, The Cider House Rules and The Shipping News), partly set in the certainly allegorical icy Swedish landscape. So here is the song sheet. For all their familiarity, Abba songs are not always the most straightforward. This certainly fits into that category. There are quite a few chords in there, but nothing very tricky, and they give real colour to the song (note that the Bm* is not a new type of chord, it’s just to distinguish that particular playing of Bm at that particular point in the song). Sometimes the timing can be a little odd as well (there’s the odd 2/4 bar thrown in along the way). But to be honest, if you know the song (and who doesn’t!) that will see you through. Oh, and I’ve also tabbed out the classic solo that occurs throughout the song. Enjoy (in a slightly maudlin, melancholic Scandinavian way)! Categories: Pop, ukulele chords | Tags: 1970s, 1977, ABBA, Pop, ukulele | Permalink. It’s strange how songs crop up in the most unlikely of places. Yesterday I attended the Wickham Festival. It’s a local festival, just down the road, and I was attending because Southampton Ukulele Jam had been asked to perform, somewhat at the last minute. We had a blast (here’s a clip of us doing Blitzrieg Bop – that’s me at the back in the straw hat! ), and got a great reaction from the audience. But it meant we had a free day ticket, so got to enjoy some great music, largely of the folk variety, from the likes of Eliza Carthy, Gaz Brookfield, Imar and Brighde Chaimbeul. Anyway, inbetween sets there was an interesting mix of music being played, often with something of a 70s soft rock flavour (blatantly appealing to the majority demographic in attendance). And then this song popped up. It somewhat surprised me that something from a hyper-polished Swedish pop group would crop up during an English folk festival. But on reflection, it actually fitted really well. Pre-Abba, each of the band members, in particular Björn Ulvaeus and Agnetha Fältskog, had established themselves in various parts of the Swedish folk scene. And there has often been elements of folk music creeping in to their music over the years. The Way Old Friends Do is certainly one of those songs, initially just accompanied on the accordion, there is something pure and honest about this lovely song. Never recorded in the studio, the version that found its way onto 1980’s Super Trouper album was recorded live during the band’s tour in 1979, and the simple sounds of voices and accordion show that, for all the studio wizardry and perfectionism that went into ABBA’s music, cut to the core they were four great musicians. There is *nothing* complicated in this songsheet. The song only has one verse, repeated. The chords are as straightforward as they could be. The only slightly tricky thing if you try to play along (the songsheet is in the same key) is that the recording is not in any kind of regular tempo. When played alone, it’s easy to give it that regular tempo, though. So enjoy! Categories: Folk, Pop, ukulele chords | Tags: 1970s, 1980, 1980s, ABBA, Folk, Pop, ukulele | Permalink.